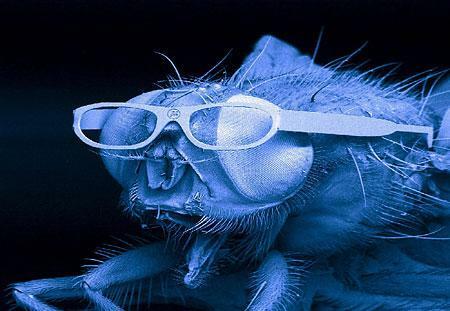 Scientists using special laser technology have crafted a pair of mini-spectacles (2 mm) and placed them on the head of a housefly. This photograph is part of a science photo exhibit being held in Munich, Germany from March 20 to 25. UPDATE 29/Mar/2006: Needcoffee.com posted a nice story about the origins of this photo. UPDATE 31/Mar/2006: An old Micreon press release explains the rest. How did they ever managed to print that tiny little logo on thin 2mm glasses? i want to ask this fly about her feelings? its not that we've fashioned some fly glasses for shits and giggles. its to show how well our technology has gotten. no expense is to great for the pursuit of science! Admiral John Q. Derpington III, Esq. "I was annoying productive people BEFORE it was cool." Once flys have 20/20 vision it will be the end of the world as we know it! il figlio segreto di bdf’s world! » Mosche con gli occhiali?